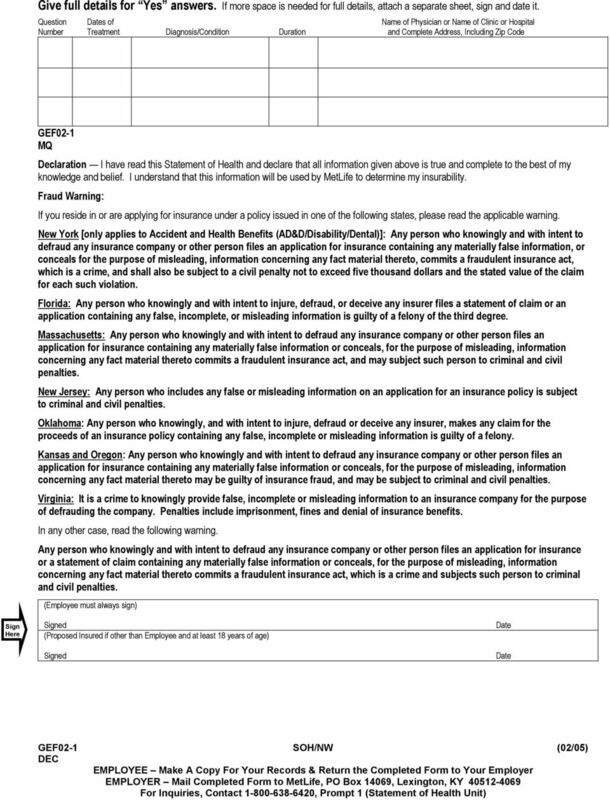 Download "Metropolitan Life Insurance Company Statement of Health Form"
4 Privacy Notice If you submit a request for insurance (Statement of Health form) we will evaluate it. We will review the information you give to us and we may confirm it or add to it in the ways explained below. 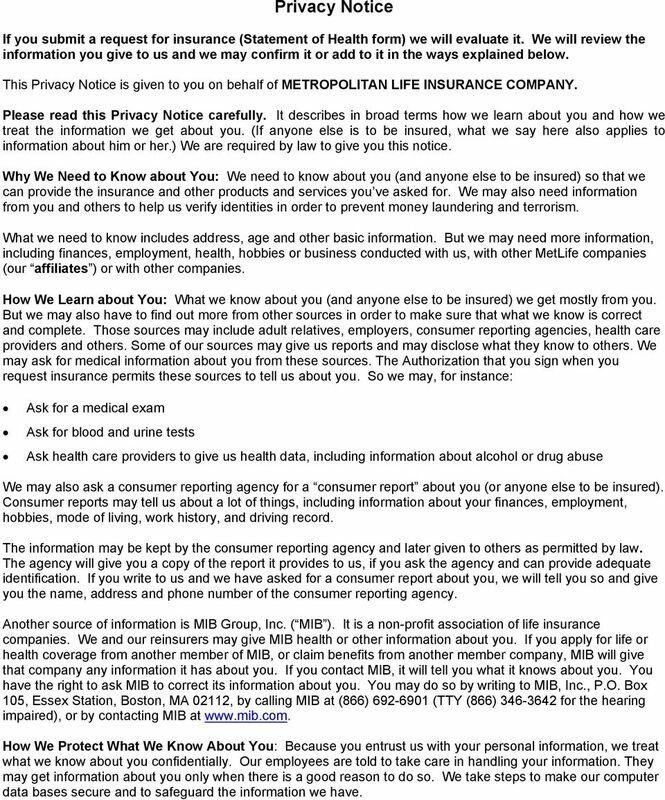 This Privacy Notice is given to you on behalf of METROPOLITAN LIFE INSURANCE COMPANY. Please read this Privacy Notice carefully. It describes in broad terms how we learn about you and how we treat the information we get about you. 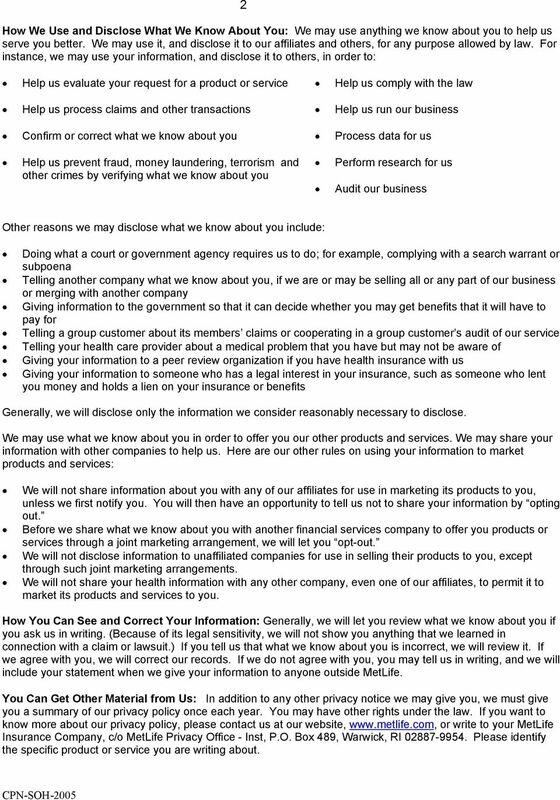 (If anyone else is to be insured, what we say here also applies to information about him or her.) We are required by law to give you this notice. Why We Need to Know about You: We need to know about you (and anyone else to be insured) so that we can provide the insurance and other products and services you ve asked for. We may also need information from you and others to help us verify identities in order to prevent money laundering and terrorism. What we need to know includes address, age and other basic information. 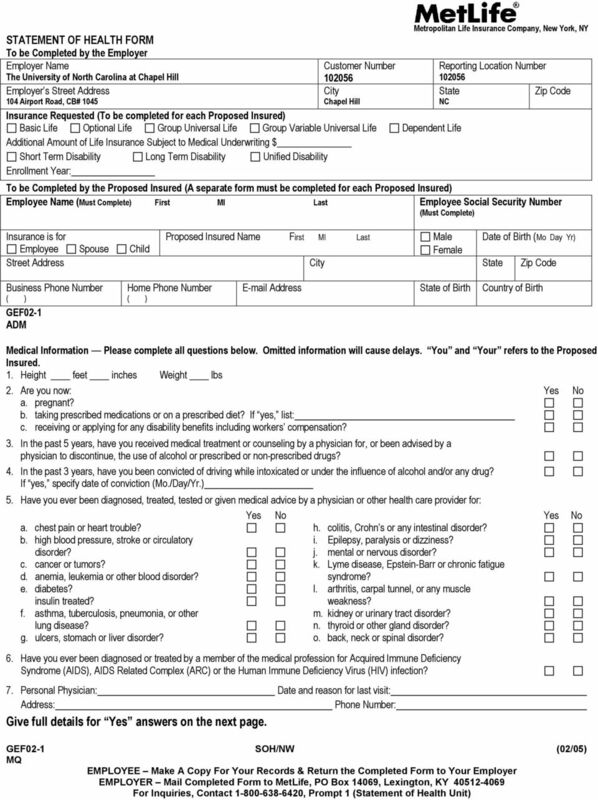 But we may need more information, including finances, employment, health, hobbies or business conducted with us, with other MetLife companies (our affiliates ) or with other companies. How We Learn about You: What we know about you (and anyone else to be insured) we get mostly from you. But we may also have to find out more from other sources in order to make sure that what we know is correct and complete. Those sources may include adult relatives, employers, consumer reporting agencies, health care providers and others. Some of our sources may give us reports and may disclose what they know to others. We may ask for medical information about you from these sources. 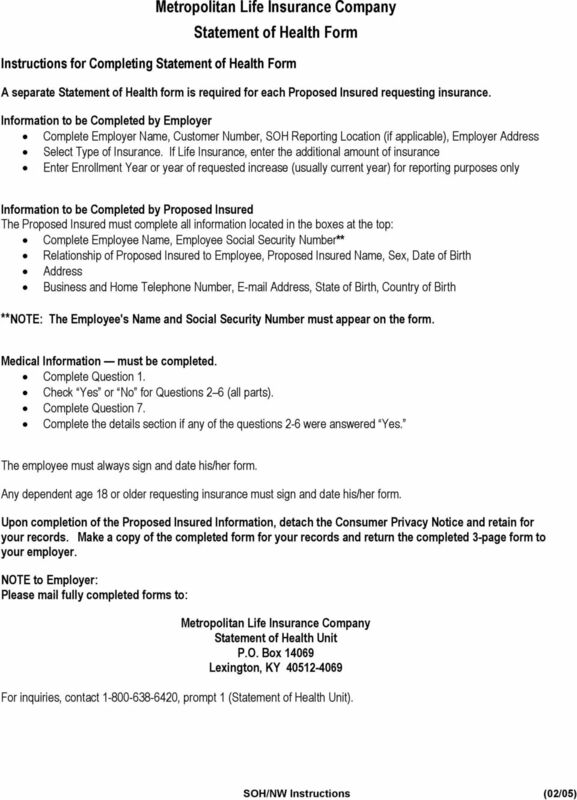 The Authorization that you sign when you request insurance permits these sources to tell us about you. So we may, for instance: Ask for a medical exam Ask for blood and urine tests Ask health care providers to give us health data, including information about alcohol or drug abuse We may also ask a consumer reporting agency for a consumer report about you (or anyone else to be insured). Consumer reports may tell us about a lot of things, including information about your finances, employment, hobbies, mode of living, work history, and driving record. The information may be kept by the consumer reporting agency and later given to others as permitted by law. The agency will give you a copy of the report it provides to us, if you ask the agency and can provide adequate identification. If you write to us and we have asked for a consumer report about you, we will tell you so and give you the name, address and phone number of the consumer reporting agency. Another source of information is MIB Group, Inc. ( MIB ). It is a non-profit association of life insurance companies. We and our reinsurers may give MIB health or other information about you. If you apply for life or health coverage from another member of MIB, or claim benefits from another member company, MIB will give that company any information it has about you. If you contact MIB, it will tell you what it knows about you. You have the right to ask MIB to correct its information about you. You may do so by writing to MIB, Inc., P.O. Box 105, Essex Station, Boston, MA 02112, by calling MIB at (866) (TTY (866) for the hearing impaired), or by contacting MIB at How We Protect What We Know About You: Because you entrust us with your personal information, we treat what we know about you confidentially. Our employees are told to take care in handling your information. They may get information about you only when there is a good reason to do so. We take steps to make our computer data bases secure and to safeguard the information we have. Disability Benefits. You still need to meet. your commitments if you. stop earning an income.